Achieving effortless elegance is as simple as black and white. It’s a timeless combination. 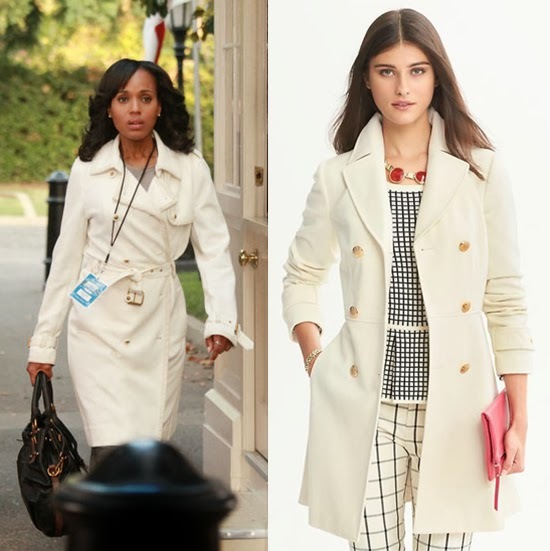 Black colorblocks or lace add a modern twist and accentuate curves on Olivia Pope. Mix and match textured and patterned suit separates with solids. Try paring a multi-colored jacket with a trouser in a matching solid color. It's not as conservative as a solid colored suit, but it still looks powerful. Camel is the new black. Try a camel suit in a slim cut to stay fashion forward, but not too trendy in the office. It's such a warm and flattering color on many skin tones. Also, consider different textures like Ms. Pope. Her jacket appears to be a soft wool, while her pants are a smooth fabric. The variety adds a welcome surprise to the monotone suit. Experiment with mixing neutrals, unexpectedly. 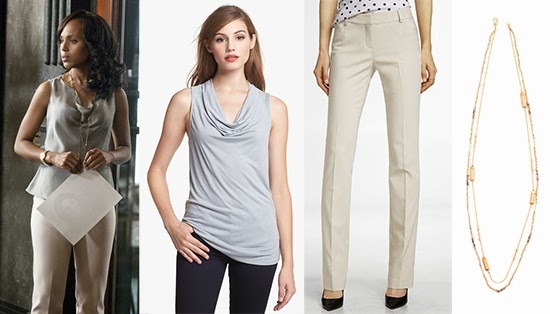 Olivia pairs a pale gray drape neck top with ivory pants and a long gold necklace. You may tend to keep your grays with white, black and silver and browns with off whites and gold. But, as you can see, combining these pale shades works just as well. This season's all about statement coats. Did Ms. Pope inspire this trend? Try a unique shape, like this folded lapel wrap coat. Olivia's was a breakout star in itself. Invest in a statement coat in a new hue. Coats are now available in a variety of colors and prints. Leave the basic black and pick one that speaks to you. Or go for winter white. It's a nice break from the typical dark colors of winter but it will last from season to season and it's one of Olivia's signature shades. Trade your jacket for a cardigan. 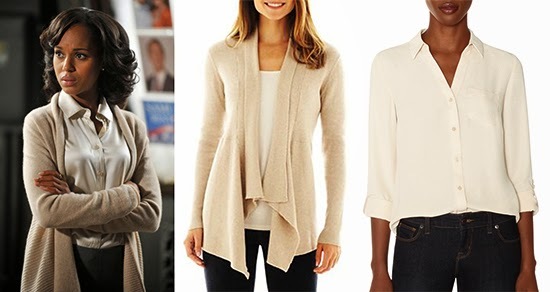 A neutral cardigan in a luxurious knit, softens workwear, but still looks professional. 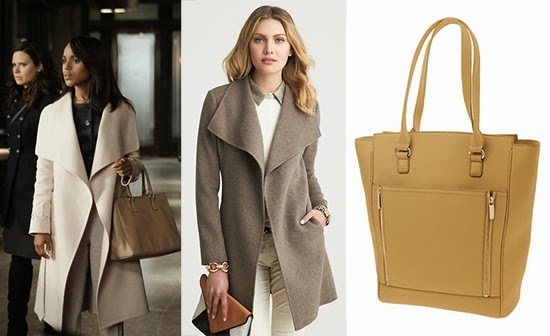 Here Olivia mixes neutrals unexpectedly again - beige & gray. Stun in elegant evening wear, that's flattering to you. Olivia Pope knows what's flattering to her body type and skin tone. Follow her suit. The detail at the top adds interest to this classic empire waist strapless gown and accentuates her waist. Champagne complements almost every complexion, especially Olivia's. 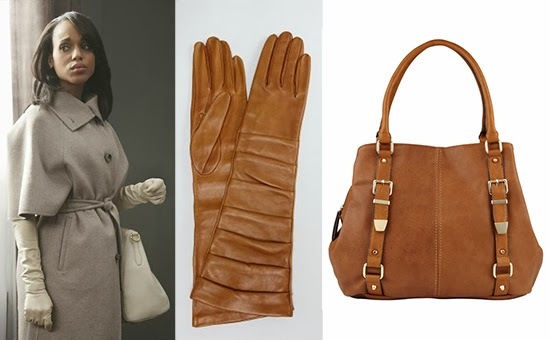 Match your bag to a pair of long gloves. First, notice how sharp Olivia looks with matching gloves and satchel. Second, she looks even more chic with the short sleeved jacket and high gloves. Enjoy Scandal tonight and be sure to take style notes from Ms. Pope. I know I will!